So you have passed the point of understanding that you need to outsource your software development project. This is undoubtedly an important decision, but another stage is waiting ahead. With so many types of outsourcing companies, deciding which one to choose is not only difficult but can lead to even more confusion. The market currently offers such a great variety of outsourcing options and different spheres of software development. Conducting in depth research is absolutely necessary before making a final decision, and this takes time. We decided to provide some assistance with this lengthy endeavor and do the research for you, keeping in mind that every detail matters when choosing the correct type of outsourcing company that best suits your project. Developing a new product or something high tech to streamline the business is needed, but momentarily lack the expertise. 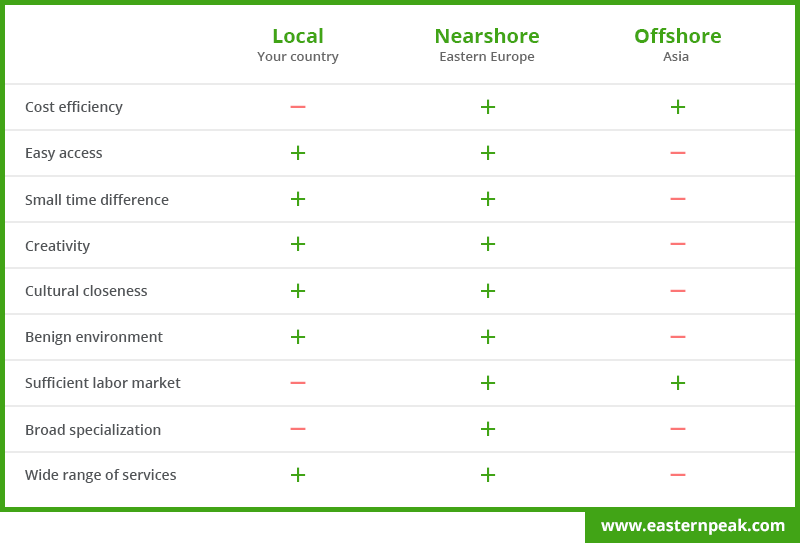 Nearshore outsourcing (a company in a country that is not far from yours, like in Eastern Europe, if you are located in Western Europe). Domestic software outsourcing has many advantages over other types of outsourcing: local teams are easily accessible, they speak the same language, they live in the same time zone, they have the same mentality as you do, you can control what they are doing and how they are doing it, plus they are not too far away should any problems arise. This is all very promising and reassuring. You quickly put together a list of local outsourcing companies that can help you, then you check their prices and… suddenly, disappointment sets in. In countries like the USA or any country in Western Europe, the cost of living is quite high, which corresponds to high hourly rates for developers (100-250$ which represents an average range). If you decide to take the risk and invest in this option, then you should keep in mind that high rates cannot always serve as a guarantee for high quality results. The chance that something may go wrong is the same as anywhere else. India is the country that immediately comes to mind in terms of offshore outsourcing, but some offshore outsourcing pros and cons have to be taken into consideration. What immediately catches your eye are the low prices. Hourly rates for software development in India range from 10-20$, which sounds unbelievable. The cost of living is low, so this makes perfect sense. Nevertheless, there are many hidden nooks and crannies when it comes to outsourcing to India; many more than other types of global outsourcing markets. Below we will explore what those are. This is a well-known sad story: you get trapped by low costs, and you entrust a company with your project. When the release deadline comes, they still need more time to work on it. It’s OK, you think, they can take their time, this is still very cheap. Then the situation is repeated, regret sets in and you begin to think twice about the decision you made. Perhaps when you receive your final project you end up with something totally different from what you had expected. There are explanations for this. Some of them are very simple, and you may feel shocked you hadn’t thought about them yourself. The first is the lack of communication. What does this mean? Your team is located very far from you, and personally visiting is counterintuitive because you are trying to save money while also spending more money on pricy plane tickets. Keep in mind you have to make all the necessary vaccinations to be allowed to enter the country and leave it safely. When considering cooperation, don’t forget that there may be language or cultural barriers? Another factor to keep in mind is that the standards for quality in India are very poor. It will therefore be very expensive to maintain the product in the future. hard-code programming will require rewriting most of code. If you are fed up and decide to move to another company and continue with the development, the likely outcome is that they will need to start from scratch due to poor architecture. Outsourcing to Eastern Europe for a long time was not taken into account at all, with outsourcing being literally called “an Indian business”. However, in recent years, its popularity has boomed in Eastern Europe and growth will continue unforeseeably into the future. The explanation for that is, Eastern Europe, in terms of outsourcing software development is a “golden middle”. Eastern Europe presents an attractive software destination due to a suitably proximate location to western markets, a minor difference in time zones, similar culture and mentality and hourly rates that range from 25-50$. Due to the Soviet engineering-based education system, Eastern European countries are oversaturated with high-tech specialists. In addition, they speak English very well and offer versatile skills, both in software and hardware. This is a perfect outsourcing choice for projects requiring creative thinking and experimental tasks. Another advantage is, usually software companies in countries like Poland, Estonia or Ukraine offer a full range of services, unlike offshore Indian companies. Your product most likely will not only be developed, but fully supported. You still have to be attentive and pay attention to many other details. Just to be on the safe side, you’d better get acquainted with our list of signs that you have made the wrong choice. We hope our research helped you to find the type of outsourcing company you were looking for and saved your time and money. Ready to get started with outsourcing? Contact us to claim your free on-line consultation!